I have been excited for the last week because the David A. Straz, Jr. Center was kind enough to give some Tampa Bloggers tickets for Tampa's opening night of Elf the Musical. I used to attend musicals all the time as a child in the Cincinnati area; but this was my first time attending one as an adult. It was also my first time getting to see a musical on opening night. Walking up to the Straz Center I was transported back to my 6 year old self. There were lights every where, Santa Claus was outside the theater, patron's were pulling up in limo's, other patrons were dressed as though it were opening night in New York City and there were even a few local celebrity sightings ("Copper Top" from Mix 100.7 was standing near me in line...). To be honest...I didn't know what to expect going into the Elf Musical. I have only seen Elf once and it was years ago. I liked it, but I am not a Will Ferrell fan (let the hate mail begin!). Thankfully, this musical brought another dimension to "Buddy the Elf". I LOVED the musical. One of the first things that you should know is that this musical is approximately 160 minutes (including a 15 minute intermission). There are snacks, drinks and even Elf merchandise that can be purchased outside the theater. Another thing you should know is that the musical contains some adult language and references. Most children would not understand the references, but parents should be aware. 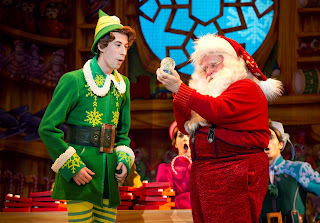 Elf the Musical opened with Santa Claus. After a few funny minutes, he decides to tell the audience the story of "Buddy the Elf". Matt Kopec does an amazing job as Buddy. He will captivate you and have you asking "Will who?" by the end of the first song. Kopec bought out the true innocence and sweetness of Buddy the Elf. Another pleasant surprise was young Connor Barth who plays Michael (Buddy's Brother). This young actor did a superb job. I can't imagine being his age and having the discipline and skills that he demonstrated at the musical last night. Other performers to note are Katie Hennies as Jovie (she has an amazing voice) and Julia Louise Hosack as Emily. I was also happily surprised by how dang funny this musical was. There were jokes spread throughout the musical that picked at current affairs and celebrities and even the audience a little (Santa grabs a phone and talks about how annoying it is to have a cell phone go off in the middle of the story). Fri. 23rd: 2pm and 8 p.m. Sat. 24th: 2pm and 8 p.m.
Sun. 25th: 1pm and 6:30 p.m.
You can also check out the Elf The Musical on Tour page for other cities that they will be performing in. Don't miss this one! If you do you are a Cotton-Headded-Ninny-Muggins! Disclaimer: I was provided with free tickets in exchange for this review. I was not compensated in any other way. All opinions are my own. Thank you for the great review. I really did like the movie but seeing it live would be awesome! Thanks for the review. It looks cute! Too bad I live so far away. looks entertaining! Would love to watch it! I would love to see this sometime. Elf is one of my all time favorite movies. This is great! I know a few people who loved the movie so much, they will be ecstatic to see it live! I'm glad you enjoyed yourself. Elf is one of those movies that is family friendly and lots of fun. I know my kids liked the movie and we will try and see it if the production comes to our area.